Throw a Delightful . . . Art Party! An art party can be a fun way for your child to share his or her creative side with friends. It's great for a summer morning playdate or a birthday. 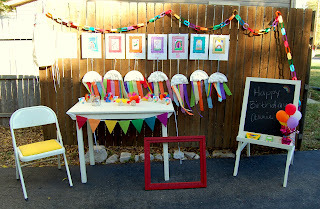 We've found lots of unique and fun ways to make an art party delightful for your child. Of course, you will want to start with one of these darling invitations. A colorful invitation is a great way to get a child excited about an upcoming event. We love these art-themed invitations found on our sister Printswell site. Jen at Beauty in Bloom, celebrated her daughter Annie's birthday with an art party. We love the creative way she had the kids draw & paint on paper pre-printed with a frame. They look great all hung together on the fence "gallery" outside. The rainbow of colors keeps the style bright and fresh. On her blog, cutest little things, Judy shared what she did for her son's fourth birthday. 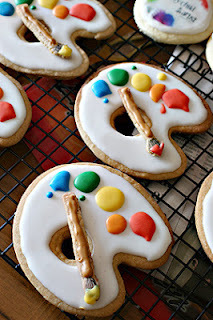 Take a look at those art palette cookies! It looks like a pretzel is the paintbrush. Very sweet! 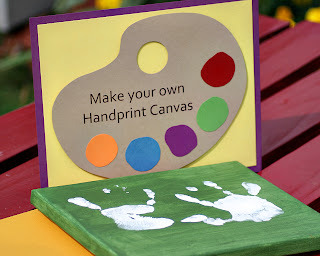 The kids all created handprint art on canvases that she had pre-painted a solid color. A creative favor from a super cute party! 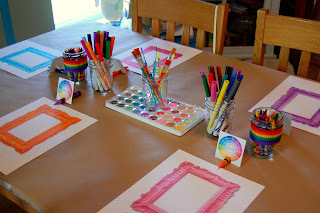 Find our art party board on Pinterest to see more great ideas!